Among all the analyst report out there, Neilson is one of the best and reliable source of information related with mobile phone business. They just released their Q2 2012 findings on the US smartphone market. As we can expect, smartphone market is growing up and up only and two thirds of all new customers picked a smartphone. In Q2, 54.6% of new smartphone buyers choose Android as their operating system with Apple holding the 2nd position with 36.3% sales. Both of these companies continue to cut the share from others like RIM, Microsoft and Symbians. 51.8% smartphones used in US are Android powered now while Apple’s share is 34.3%. Remember Q2 is the quarter before the Samsung Galaxy S III release as well as it’s the third quarter for Apple iPhone 4S. 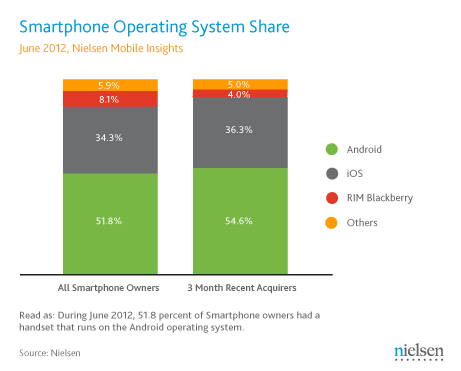 While the RIM OS still powers a respectable 8.1% of US smartphones, it only managed a market share of 4% with new subscribers. So the falling rate is almost 100%. Microsoft made and mainly Nokia powered Windows Phone only managed a market share of 1.3%. The Nokia Lumia lineup is still struggling to make an impact, covering just 0.3% of the market. 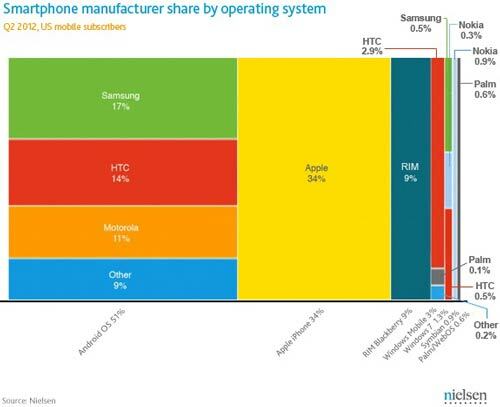 Interestingly Samsung is sharing .05% of all Windows Phone 7 phone while Nokia’s share is .2% less than that! Samsung is also leading the Android war with 17% share of 51.8%.